* How do I install brake heat shields? Home >> Brake Heat Shields >> How do I install brake heat shields? How do I install brake heat shields? Installing our heat shields is as simple as changing your brake pads, a quick and simple job that will take just minutes with no special tools required. Our titanium brake heat shields fit between the brake pad backing plate and the caliper pistons as shown in the picture here (the heat shields have been highlighted in "Hard Brakes Yellow"). 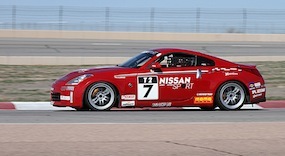 With most caliper systems, our brake shims attach using the same mechanism as used for the brake pad itself (e.g. caliper pins, spring clips, backing plate shape). 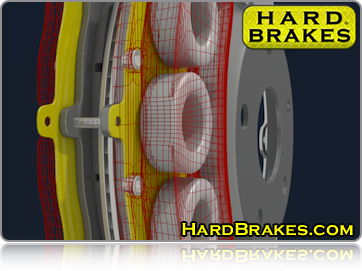 Hard Brakes heat shields provide cut outs to fit around clips and protrusions that are often on the backs of brake pads. Some models provide a “punch out” design that allows you to easily remove a section of the shim to fit around a protrusion. A small saw or rotary cutting tool will cut through the small retaining tabs for the cutouts. Make sure your heat shield rests flat against the brake pad backing plate. Different brake pad manufacturers place various nibs and rivets on the back of their brake pads, and we are not able to anticipate and provide cutouts for all of them. Typically the easiest way to deal with these is just to grind off the problem nib. Alternatively you can drill a relief hole in the heat shield. Feel free to contact us with any questions about how to deal with your situation. 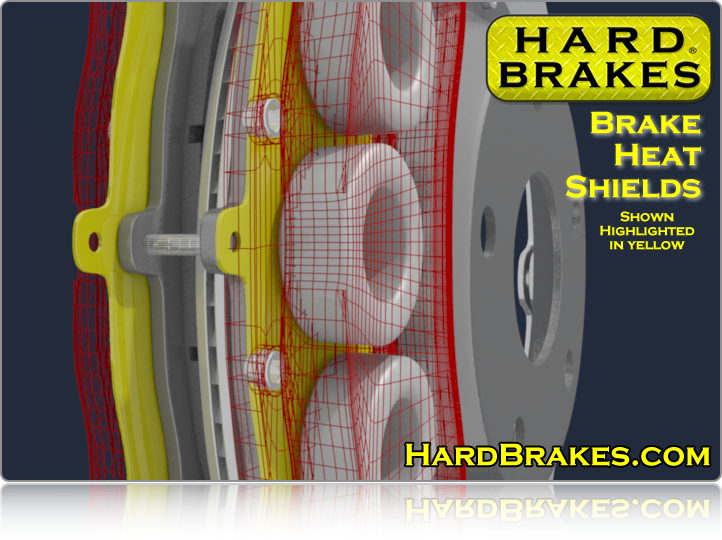 In a few rare exceptions our heat shields come with tabs (visible on the schematic diagram for the model) that you should bend over the brake pad in order to hold it in place. If you are using a shield model with tabs to bend in place we recommend lightly heating each tab with a standard torch immediately prior to bending over the pad edge for best results. This is easiest to do if you secure the pad and shim in a vise, using scrap to protect the pad surface. We recommend that a brake lubricant such as our Permatex High Temperature Ceramic Lubricant be applied to the areas where our titanium brake backing plate makes contact with the caliper mounting points, caliper pistons and brake backing plate (in that order of priority).